A codicil is a legal document that changes specific provisions of a last will and testament but leaves all the other provisions the same. You can modify, update, or even completely revoke your last will and testament at any time as long as you're mentally competent. The question becomes, when should you make a codicil and when should you write an entirely new will? 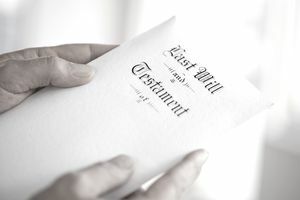 There aren't really any written rules as to when a codicil is required instead of an entirely new last will and testament. The general school of thought is that a codicil should suffice if you just want to make minor changes, such as adding or deleting specific bequests, changing who will serve as your personal representative, or updating the name of a beneficiary or your personal representative due to marriage or divorce. Consider making a new will if the changes you want to make are substantial, such as because you've married and you want to add your new spouse as a beneficiary. It is also a good idea if you're cutting out a beneficiary or changing distributions from family members to charity or vice versa. Just make it clear that your original will is revoked. Either destroy it along with any copies that might exist or write "REVOKED" on each page with your initials or signature. What if you've made a series of three or four simple codicils over the years and now you want to make yet another minor change? Consider consolidating all your changes into a brand new will. This will prove helpful to your personal representative who will then have a single document to follow instead of piecing together provisions of four or five separate documents. It can also help to ensure that the court will approve your will as valid because a brand new will clearly depicts your final wishes as opposed to a hodgepodge of provisions that might make your intentions seem unclear. A probate judge might declare that your entire will is invalid if this happens, or he may decide not to honor some or all of your numerous codicils because the overall picture of your final wishes is confusing. If a judge decides your will is invalid, the end result would be the same as dying without having left one at all. Your estate will pass to your next of kin under state law based on how closely related you are, even if this is not what you would have wanted. Your estate might go to the son or daughter you've been estranged from for years. It's very important that you don't simply mark up your will by hand and stick it back in a drawer if you want to make even minor changes to it. That too can invalidate your entire will or, depending on applicable state law, the handwritten changes may be ignored. Another consideration is that a codicil must be prepared following certain legal guidelines and signed with all the same formalities as your original will. If you're going to go to all this trouble, you might want to take the safer route and simply create a whole new will instead. Otherwise, ask your estate planning attorney to prepare the codicil for you, so you're sure it will be legally valid and binding. Can a Simple Personal Property Memorandum Change Your Last Will? Do You Need a New Will When You Move to a New State? Does Your Last Will and Testament Hold Up Under the Law? Is Writing Your Own Will a Good Idea? Can You Contest Your Loved One's Will?